The Decoz Numerology Master Program Generates the Most Extensive, In-depth Numerology Reports Available. A suite of software components that puts the knowledge and insight of an expert Numerologist into your hands. One Format -- Each component uses the same software format - learn to use one, and you've mastered them all! Saved Profiles -- Each person's information is saved in a profile log, so you can easily run future reports for them. Add & Remove Report Topics -- An easy button interface lets you add and or remove topics from each report. Customizable Formatting -- Easily change font styles and report layouts. Tri-Lingual Reports -- Produce reports in English, Spanish or Portuguese ... and switch between them! Non-English Characters -- Enter names using nearly any western character, not just the 26 characters of the English alphabet. Decoz Numerology Reports and Forecasts are considerably more in-depth and extensive than those of our nearest competitor and is uncompromising in its quality. Numerology ChartMaker program color version FREE with purchase of all three packages. Download a trial version - includes mini-readings, one full report, and anything else you need to test-drive this software. Need to replace your numerology software? 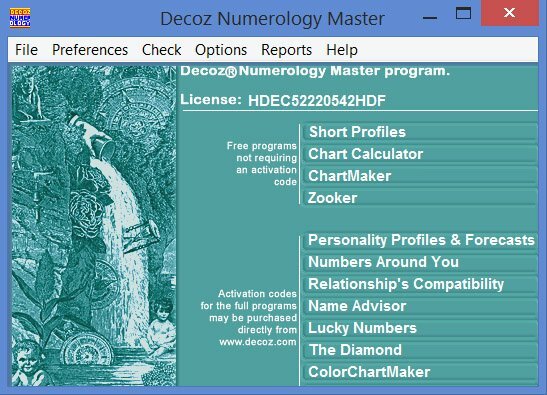 See also our support page for the Decoz Numerology Master program.